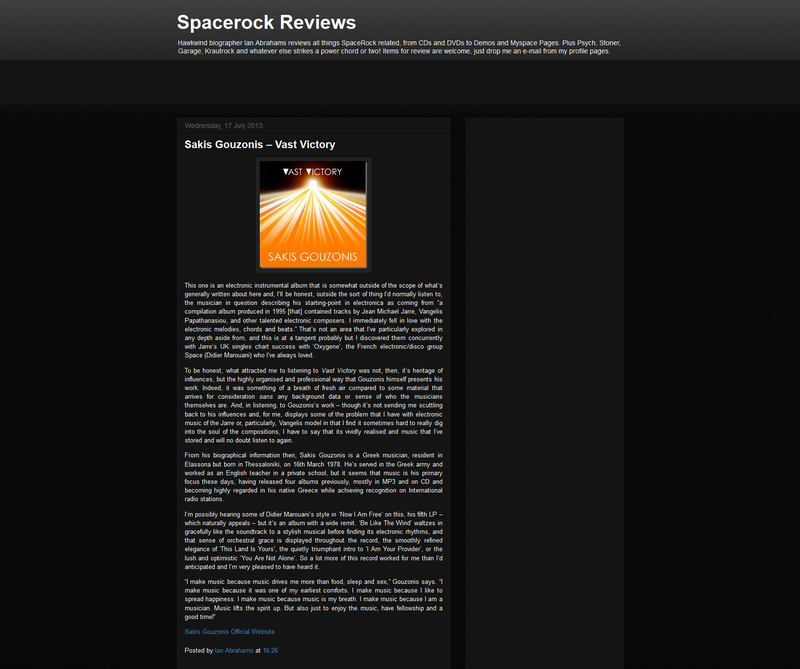 Here you can read album reviews, which are also available in JPG format. For any questions or requests you may have, contact Sakis Gouzonis. This one is an electronic instrumental album that is somewhat outside of the scope of what’s generally written about here and, I’ll be honest, outside the sort of thing I’d normally listen to, the musician in question describing his starting-point in electronica as coming from “a compilation album produced in 1995 [that] contained tracks by Jean-Michel Jarre, Vangelis Papathanasiou, and other talented electronic composers. I immediately fell in love with the electronic melodies, chords and beats.” That’s not an area that I’ve particularly explored in any depth aside from, and this is at a tangent probably but I discovered them concurrently with Jarre’s UK singles chart success with ‘Oxygene’, the French electronic/disco group Space (Didier Marouani) who I’ve always loved. To be honest, what attracted me to listening to Vast Victory was not, then, its heritage of influences, but the highly organized and professional way that Gouzonis himself presents his work. Indeed, it was something of a breath of fresh air compared to some material that arrives for consideration sans any background data or sense of who the musicians themselves are. And, in listening to Gouzonis’s work – though it’s not sending me scuttling back to his influences and, for me, displays some of the problem that I have with electronic music of the Jarre or, particularly, Vangelis model in that I find it sometimes hard to really dig into the soul of the compositions – I have to say that it’s vividly realized and music that I’ve stored and will no doubt listen to again. From his biographical information then, Sakis Gouzonis is a Greek musician, resident in Elassona but born in Thessaloniki, on 16th March 1978. He’s served in the Greek army and worked as an English teacher in a private school, but it seems that music is his primary focus these days, having released four albums previously, mostly in MP3 and on CD and becoming highly regarded in his native Greece while achieving recognition on international radio stations. I’m possibly hearing some of Didier Marouani’s style in ‘Now I Am Free’ on this, his fifth LP – which naturally appeals – but it’s an album with a wide remit. ‘Be Like The Wind’ waltzes in gracefully like the soundtrack to a stylish musical before finding its electronic rhythms, and that sense of orchestral grace is displayed throughout the record, the smoothly refined elegance of ‘This Land Is Yours’, the quietly triumphant intro to ‘I Am Your Provider’, or the lush and optimistic ‘You Are Not Alone’. So a lot more of this record worked for me than I’d anticipated and I’m very pleased to have heard it. The Greek Composer released his fourth album in November 2011. With the title ‘Ultimate Love.’ So I’ll have a listen and see if I ultimately love it. If you would like to hear the album yourself, it’s free to download from his website. Strong is a very melodic and well-produced song. The melody makes up for there not being any vocals. Yet I still can’t help but feel like I’ve heard this tune somewhere before. I like that Gouzonis has used very ‘thin’ drums. The usual with electronic music producers is to whack the bass up and drown everything else out. When You Touch Me starts off with a nice atmospheric sound and a lovely flute melody. A relaxing, beautiful piece of electronica but would have preferred a bit of variation on the melody. Like The Sun would be the perfect song for the end of a sad movie, leading into the credits. The high pitch synths and arpeggiated melody are enough for background music but I probably wouldn’t find myself turning this song on specifically. Everyday Protection has the perfect pop music structure. But it sounds rather like the last song. I can’t really comment much further than that. I Will Be There has a very strong synth lead, filling out the entire sound. Repetitive, but easy listening. There’s nothing that I can pick out as not fitting in or out place. There’s an unpredictable change at the end, I like that I had to concentrate on something different. Fly High didn’t live up to its ‘high’ expectation that I had. (See what I did there?) A very cloudy-atmospheric song. But yes, I’ve heard this melody before. I think it’s that Vitamin C song that first comes to mind, but you could also listen to any other song that uses Canon for its melody. Now I like this! Memories is your typical electronica song. Faster hi-hats, medium kick, and enjoyable melody. Probably the best song so far. But there’s a bit more to come yet. You Healed My Heart is the second some on the album that is 4:04. Made me giggle because most of these songs are in 4/4 timing too. The musician in me is coming out! Anyway, about the song! Again, it’s very cloudy and atmospheric (again) but there’s some changes in the drums to some low pitch hits that sound like real drums. Makes a nice change that you don’t normally hear in this particular genre. Light In The Night has the call and response factor. Which means one sound that has a response of another sound, that repeats. 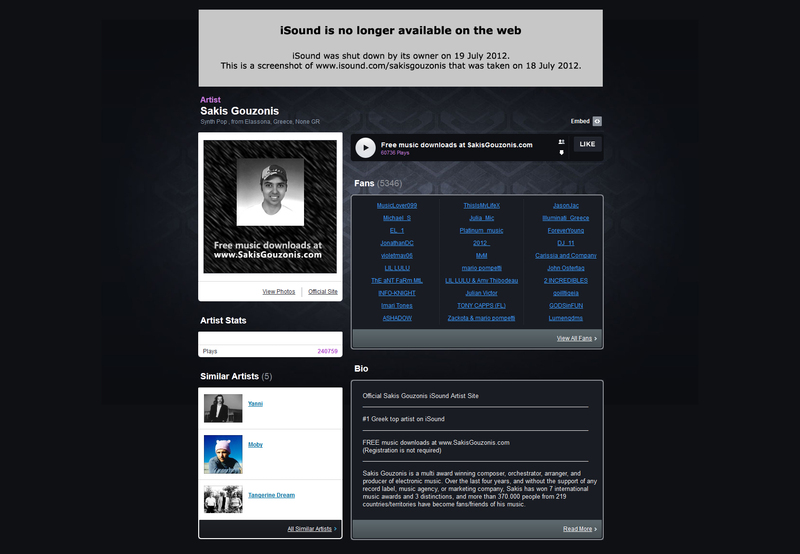 Gouzonis is an excellent producer and songwriter. I wonder how he will end the album now? Well, the rest of the album has been perfectly in time, but Gouzonis is pushing his luck here. Yes, the song is in time, but barely. I Am The Way is a nice end to the album, but not really the big bang that I was expecting. Overall a fantastic album, and considering it’s free you can’t really go wrong. Greek electro whiz Gouzonis has released three albums over the last four years, winning multiple awards for his music. What makes this all the more impressive is that it has all been done independently with no labels/agencies involved in supporting him. 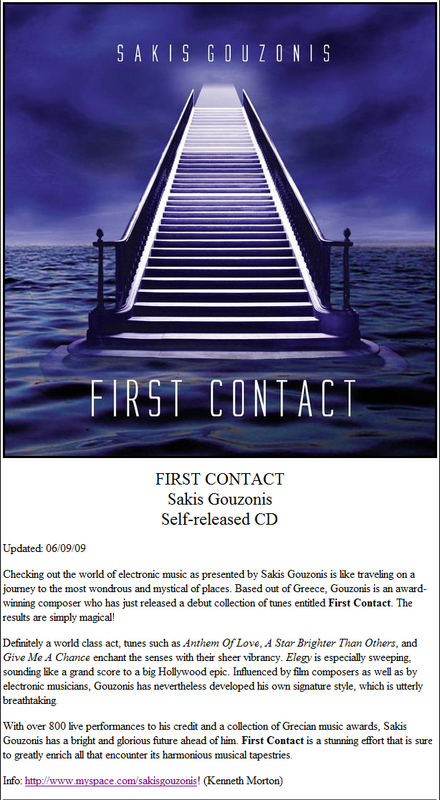 Sakis’s music is entirely instrumental and this set is an atmospheric soundscape with extensive use of lush sweeping strings throughout the album and a dazzling variety of beats which lead the listener through the album. For me, the standout tracks are the simplest ones, where the range of sounds is kept to a minimum as on “Seed Of Hope” and “Holy Cure”. Mr Gouzonis has real talent for creating complex and interesting arrangements that can engage and inspire the listener. 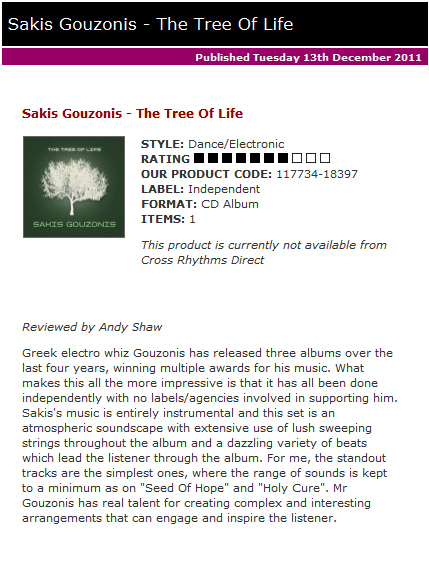 The Tree Of Life is the third album released by Greek electronic composer Sakis Gouzonis. 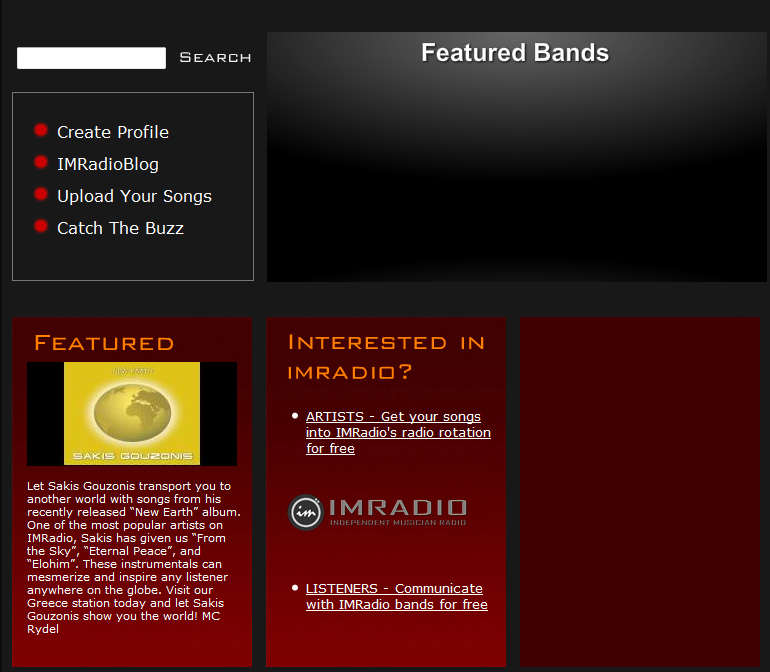 All tracks are instrumentals. One thing I love about this CD is that it causes my brain to think in images rather than words as I listen. That doesn’t happen to me that often. It’s not simply the lack of lyrics that causes that, but the vibrant and evocative tones that Sakis chooses. He is able to create a living, visual landscape through his music, which seems rare for electronica. Another thing that sets this CD apart from a lot of other electronica is that no track drones on. In fact, a couple of the tracks seem to end too soon. This is not mindless club music, where one track could easily substitute for another. Each song is distinct and has its own story to tell, its own emotions to evoke. The Tree Of Life opens with “Seed Of Hope.” “Seed Of Hope” is electronica, but with almost a New Age bent, like if Windham Hill had gone more fully along the electronica route. It’s not really club music, though it has a good beat. This is music to take you out of your body, to lift you away from mundane concerns and make your mind go off into some other realm. “Two Worlds United” has more of a pop feel, but like 1980s pop (which of course is the best kind). It’s the rhythmic keyboard part that adds that element. I’ve always said I can do without rain sound effects in songs (I even dislike it in “Riders On The Storm”). But then again, I own one of those rain sticks. So what am I talking about? Anyway, the rain-like sound is only at the beginning of this track. And then “To See Your Face” moves into its main section, which has a truly pretty sound. How often do you think of electronica as being passionate? But this love song has a definite passion to it. When “From The Four Winds” starts, the keyboard fades in, like a twisted carnival ride operator approaching you atop a mechanical beast of his own creation. And the whole track reminds me of some dream-like funhouse or ride. Fellini would enjoy this one. And it’s one of my personal favorite tracks. The song pulls you along, like it has you on its own ride. This is one that ends too soon. “With Respectful Hearts” reminds me of some mid-1980s film soundtracks. Where there is a love story, and a character is learning a valuable life lesson. And there is some mild danger from a villain played by James Spader. If you infer from that that I dislike the track, you’re wrong. It’s totally enjoyable. It’s just that it has this weird nostalgic sound for me. The steady beat of “Sweet Joy” makes this one closer to a dance tune. But there is more going on in this song than a simple dance rhythm. There is a beauty to this track, and a positive vibe. Sakis is really able to build something wonderful from a simple pop rhythm. This is one of my favorite tracks. “An Endless Love” is definitely more in the dance pop vein, even with a repeated cheesy synthesized percussive sound effect. It calls to mind the last dance at a prom, with lights flashing on the heroes of a love story as they finally come together for a joyous spin around the floor. “Holy Cure” works on a completely different level, like an erratic heart beat thumping below the soaring tones on the keyboard. The album concludes with “The Source Of Light,” another wonderful track to pull you out of your own head and into the sky. Like walking on a ray of light, or being pulled through clouds – without fear, without danger. It’s like a slow, swaying dance in orbit. This is another of the CD’s best tracks. The Tree Of Life was released on October 10, 2010. His previous two albums were released on August, 8, 2008 and September 9, 2009. So that’s 8-8-08, 9-9-09 and 10-10-10. I can’t help but wonder what happens when we get to 2013. 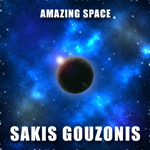 Though a new name to many, in his homeland of Greece, Sakis Gouzonis has topped the MySpace Pop and Electronica chart. Closer to home, he has been a semi-finalist in the UK Songwriting Competition (Instrumental section) with two tracks, including ‘Eternal Peace’ from this disc. While his First Contact release lacked variety, this more fluid follow-up sees him developing range in his music. ‘So This Is Heaven’ has hints of the hymns that he recorded at the start of his career. The invigorating opener ‘From the Sky’ uses separate synth tones for different melody lines over a pulsing Euro-beat. He adds enough variations to keep the track fresh throughout. As stately as their names suggest, ‘Elohim’ and ‘Eternal Peace’ are typical of the bulk of the disc; and the rather direct ‘Thank You for the Music’ has Andy Hunter written all over it. There are two aberrations: ‘A New Beginning’ feels a bit cheesy in places, while the staccato ‘Cosmic Crossroads’ is too reminiscent of the novelty hit ‘Popcorn’ for comfort. Overall, it can feel a little formulaic. Otherwise, this soaring instrumental music, which provokes unavoidable comparisons to the work of Jean-Michel Jarre, should do nicely as a soundtrack to the sunnier days ahead. I just love it when I get an email saying “I have an album out, would you like to review it?” It’s one of the ways that I can discover new music and some new artists. 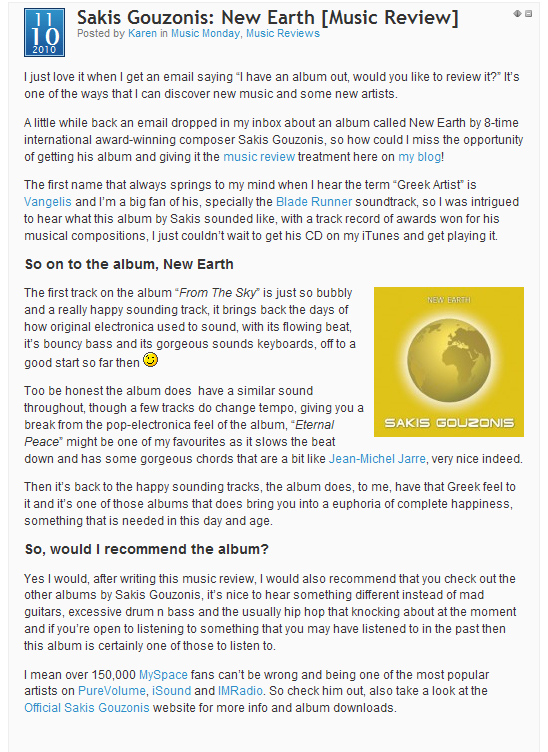 A little while back an email dropped in my inbox about an album called New Earth by 8-time international award-winning composer Sakis Gouzonis, so how could I miss the opportunity of getting his album and giving it the music review treatment here on my blog! The first name that always springs to my mind when I hear the term “Greek Artist” is Vangelis and I’m a big fan of his, specially the Blade Runner soundtrack, so I was intrigued to hear what this album by Sakis sounded like, with a track record of awards won for his musical compositions, I just couldn’t wait to get his CD on my iTunes and get playing it. The first track on the album “From The Sky” is just so bubbly and a really happy sounding track, it brings back the days of how original electronica used to sound, with its flowing beat, it’s bouncy bass and its gorgeous sounds keyboards, off to a good start so far then. To be honest the album does have a similar sound throughout, though a few tracks do change tempo, giving you a break from the pop-electronica feel of the album. “Eternal Peace” might be one of my favourites as it slows the beat down and has some gorgeous chords that are a bit like Jean-Michel Jarre, very nice indeed. Then it’s back to the happy sounding tracks, the album does, to me, have that Greek feel to it and it’s one of those albums that does bring you into a euphoria of complete happiness, something that is needed in this day and age. So, would I recommend the album? 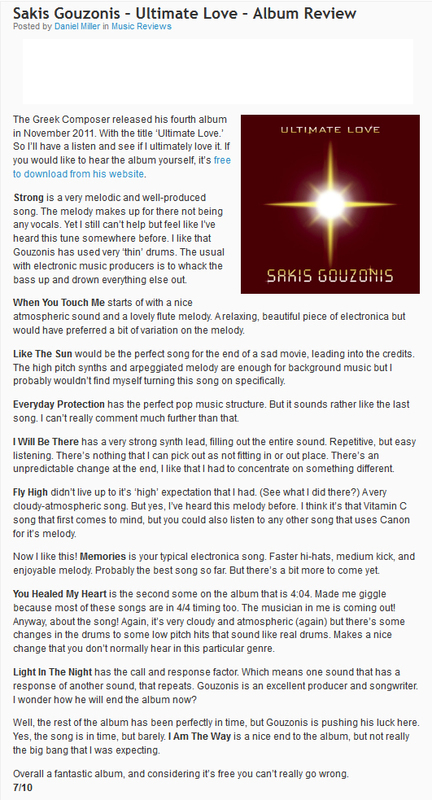 Yes I would, after writing this music review, I would also recommend that you check out the other albums by Sakis Gouzonis, it’s nice to hear something different instead of mad guitars, excessive drum ’n’ bass and the usually hip hop that knocking about at the moment and if you’re open to listening to something that you may have listened to in the past then this album is certainly one of those to listen to. I mean over 150,000 MySpace fans can’t be wrong and being one of the most popular artists on PureVolume, iSound and IMRadio. So check him out, also take a look at the official Sakis Gouzonis website for more info and album downloads. Sakis Gouzonis, now based in Elassona, is a great example of a musician’s work showing the inspiration of his surroundings. His keyboard instrumentals exude the sunshine and vitality of Greece. A definite one-man act, he began arranging and recording when he was quite young, releasing a compilation of hymn arrangements while still at school and even then getting a positive reaction from Europe, the Americas and Australia. His career took off when he entered the fifth international Composition Competition, winning third prize and a commendation award in the ‘digital dance music’ category for two tracks from his 2008 album First Contact. That album had the roots of this disc, but across the whole album his compositions betrayed a formulaic approach and the playing could be quite staccato and rigid. It cried out for more variety. He has made great progress with this follow-up, which is more fluid, more varied and has several outstanding tunes. In particular, he has developed the anthemic tracks that soar and lift the spirit, such as “From the Sky” with its driving melody; “Elohim” with its sense of grandeur; the expansive “Eternal Peace” and “The Light Within Us,” which seems to have it all – inspiration, melody and a rounded arrangement. There are weaker tracks, such as the cheesy bits of “A New Beginning” and the stilted, plinky-plonk “Cosmic Crossroads,” which unfortunately reminds me of the UK one-hit wonder “Popcorn” that took advantage of the Moog’s novelty in the early seventies. Sometimes (but less often than on his previous CD) the key changes sound a bit predictable. One track that stands out is the simplest and most direct. “Thank You for the Music” is quite Andy Hunter-like in its effect, although it is less kaleidoscopic than Hunter’s material. Its simplicity works and the piece is strikingly memorable. With his similarity to Jean-Michel Jarre, I can see Gouzonis working on film soundtracks, but they would probably have to be comedies or feel-good movies, as his music usually takes you to sunny places. 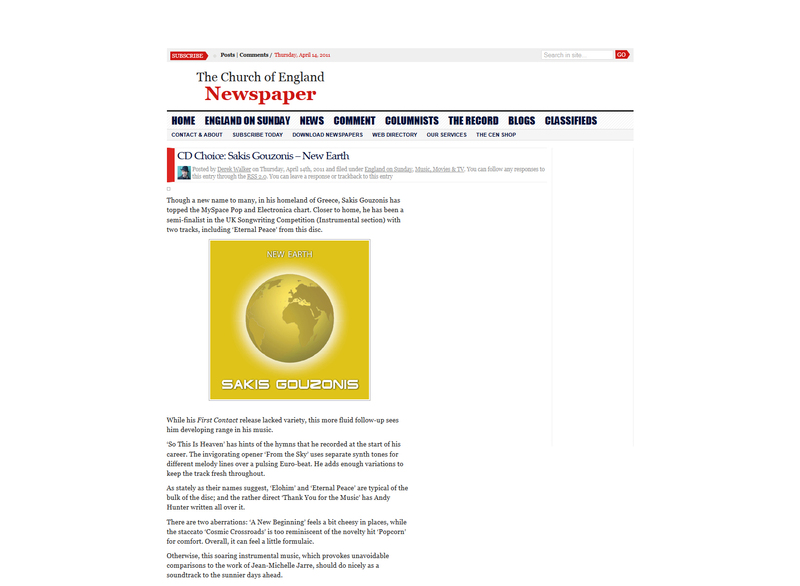 Let Sakis Gouzonis transport you to another world with songs from his recently released “New Earth” album. 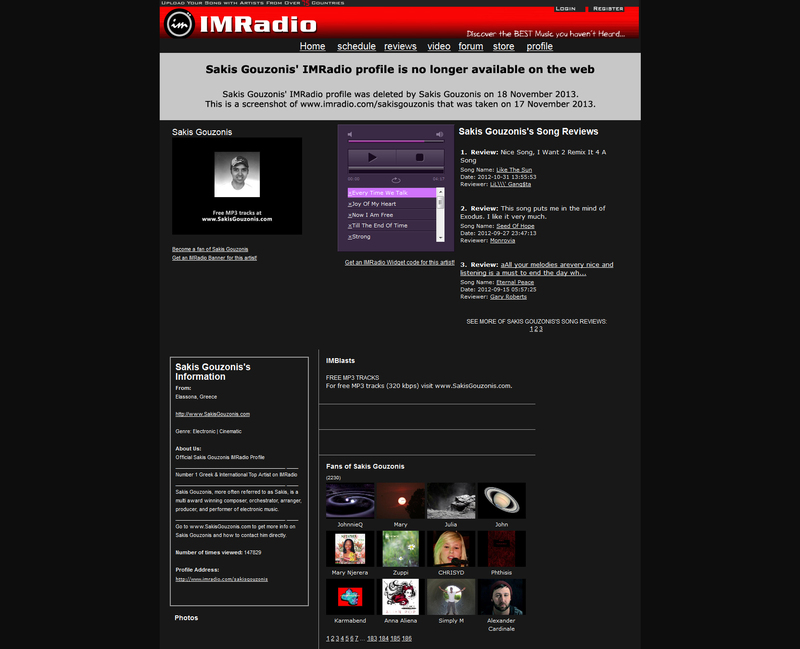 One of the most popular artists on IMRadio, Sakis has given us “From the Sky”, “Eternal Peace”, and “Elohim”. These instrumentals can mesmerize and inspire any listener anywhere on the globe. Visit our Greece station today and let Sakis Gouzonis show you the world! 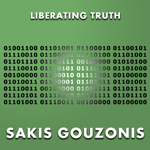 Checking out the world of electronic music as presented by Sakis Gouzonis is like traveling on a journey to the most wondrous and mystical of places. Based out of Greece, Gouzonis is an award-winning composer who has just released a debut collection of tunes entitled First Contact. The results are simply magical! Definitely a world class act, tunes such as Anthem Of Love, A Star Brighter Than Others, and Give Me A Chance enchant the senses with their sheer vibrancy. Elegy is especially sweeping, sounding like a grand score to a big Hollywood epic. Influenced by film composers as well as by electronic musicians, Gouzonis has nevertheless developed his own signature style, which is utterly breathtaking. With over 800 live performances to his credit and a collection of Grecian music awards, Sakis Gouzonis has a bright and glorious future ahead of him. First Contact is a stunning effort that is sure to greatly enrich all that encounter its harmonious musical tapestries. 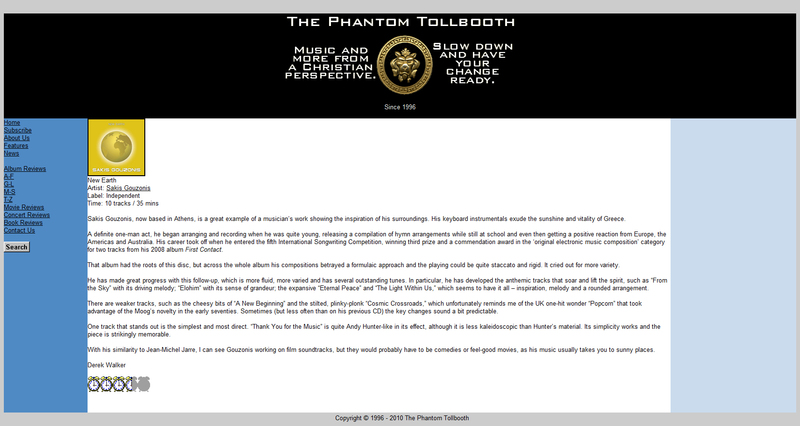 All album reviews are available both in plain text and in JPG format. 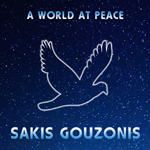 For any questions or requests you may have, feel free to contact Sakis Gouzonis anytime you want.